HAVE A SNOWMOBILE, WAVE RUNNER OR MOTORCYCLE YOU NEED TO HAVE SERVICED? Great deal on www.groupon.com today. Motorcycles were designed as a way to maneuver easily through alleys, traffic, and bristles in oversized hairbrushes. 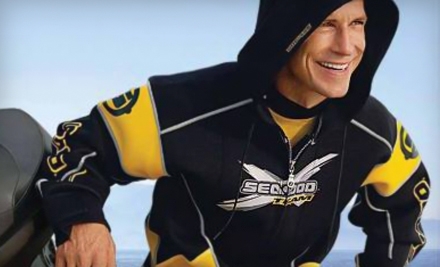 Stay primed for hairpin turns with today’s Groupon: for $50, you get $100 worth of services, merchandise, and apparel at St. Boni Motor Sports in Saint Bonifacius. St. Boni Motor Sports’ 22,000-square-foot facility is a self-contained motor-sporting ecosystem populated by a large service department, vehicle showroom, and motor-themed apparel and accessories. Spruce your ride with one of the myriad factory and after-market parts, accessories, and components stocked in store, such as Ski-Doo drive belts ($49.97–$149.99) or tires for all manner of motorized velocipede ($15.95+). On the off-chance a needed part has gone extinct from store shelves, the knowledgeable staff can order it for you. St. Boni Motor Sports is authorized to service ($85 per hour for labor, not including parts) a variety of vehicles, including Yamaha, BRP, Kawasaki, and more. Let the expert service mechanics turn your troublesome transporter back into a raging hog with an oil change ($42.50, plus the cost of oil and filter), tire installation ($30 off the bike, $70 on the bike), or a number of other services. St. Boni Motor Sports also provides seasonal clothing items for shivering riders, including Yamaha cold-weather gauntlet riding gloves ($52.49–$69.99) and a DOT-certified FX-30 full-face helmet ($74.95) by AFX. Limit 1 per person, may buy 1 additional as a gift. Limit 1 per visit. In-store only. Not valid toward sale items or gift cards.